Obverse: Radiate bust right with runic inscription to front reading ÆPA. Reverse: +T+T+T+T around a square standard made of pellets, TOTII within. History: After the demise of the Anglo-Saxon gold thrysmas the first real coinage was the sceat, small silver coins first mentioned in the laws of Aethelberht, king of Kent, circa A.D. 600. These small coins were the only unit of currency for over a century and a half. 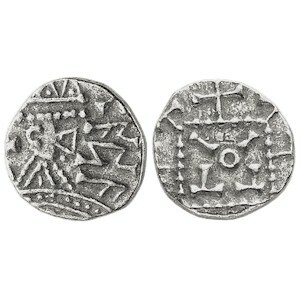 The 'primary series' of sceattas were produced and circulated from around 680 to 710 AD, they were generally of good metal quality and weight. These sceattas were primarily restricted to Kent and the Thames Estuary, though a few were produced in Northumbria.